KNOWING that two porters died at the same time she was climbing one of the world's biggest mountains has motivated Sandi Barrett to help. 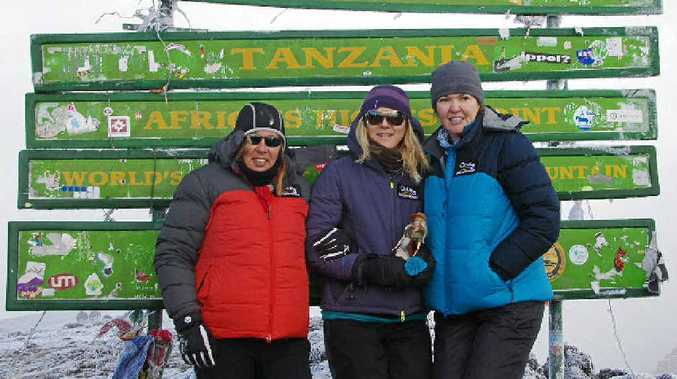 The Buderim woman completed a six-day trek to the top of Mt Kilimanjaro last month with friends Sam Jun-iper and Debbie Ladd. After the gruelling mental and physical journey, Mrs Barrett is determined to do more for the people who often risk their lives on the steep Tanzanian mountain. The 48-year-old and her fellow trekkers want to help the families of the porters who help tourists. "Unfortunately two porters did lose their lives while we were on the mountain, but in a different location," Mrs Barrett said. "The hardship these porters go through has inspired me to help in some way. "A few of us from the trip are looking into a charity where we can raise money to give directly to these families." Mrs Barrett and her fellow trekkers prepared for the steep climb with more than eight months of regular hiking and core strength training, and the guidance of Maroochydore business Kaizen Exercise Physiologists. "The exercise given by Kaizen prepared us strength-wise and all the hikes prepared us for the long days," Mrs Barrett said. "Conquering the mountain was definitely a team thing, as we all had moments along the way. The summit night was so cold ... we all had icicles in our hair. "It was the hardest and most mentally challenging thing I have ever done in my life and it has taught me that life needs to be simplified and appreciated." As part of the climb, Mrs Barrett's team raised more than $70,000 for the Make a Wish foundation.